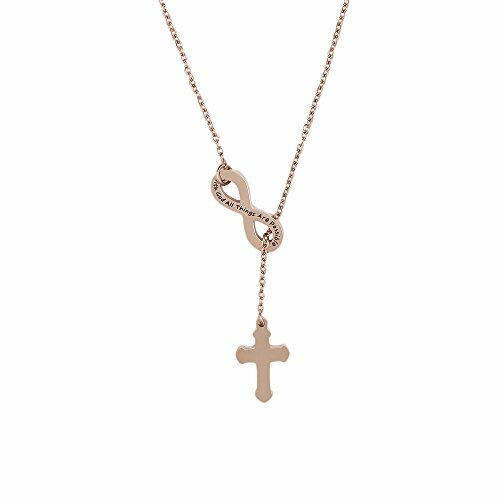 This infinity cross necklace makes this stainless steel piece a must-have for all who practice Christianity. This Christ Cross Pendant is just for you! Feel proud and confident wearing this piece! Its wearer will hold this piece with reverence and is sure to treasure the necklace for its invaluable symbol of religion and beliefs. 1)Please avoid contacting with the acid and alkali, corrosive substances. 2)Please avoid the collision, so as to avoid surface scratches. 3)Please avoid wearing this jewelry when sweating a lot, shower or sleep, etc. 4)Please wipe them with soft cloth when you clean your jewelry. ✜EXCELLENT QUALITY✜ - Material: Stainless steel, it is lead free and nickel free.Stainless Steel is hypo allergenic, it doesn't rust, change color or tarnish. ✜EXQUISITE PACKING✜ - Each necklace individually packaged in a gray velvet bag, ready for gifting! It makes a wonderful gift for family, friends, teachers...or a special treat for yourself! ✜APPLY TO ANY OCCASIONS ✜ - Perfectly fit for you to attend any special occasions, Perfect gift for birthday, Christmas, graduation, Valentine's Day, Easter, Mother's Day and any other holiday or celebration. If you have any questions about this product by VISUNION, contact us by completing and submitting the form below. If you are looking for a specif part number, please include it with your message.